I will reply to any emails within one working day. Any information which you give me will be strictly confidential and will only be used to research your family history or create your familytree. Remember, a chat is free! I carry my phone at all times, but do not answer if I am driving. Please leave a message or text and I will reply as soon as I can. My great uncle, Tom Waling, 1911-2010. 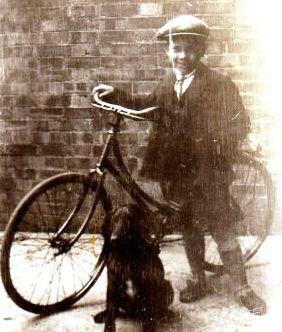 Aged 98, Tom recalled that he never owned a bicycle as a boy and said that this one must have been borrowed for the photo! Looking more closely, it does look a bit big for him... The dog was definitely his, though. Tom was so helpful in tracing my family history and making my family tree - he had lots of lovely detailed memories - a genealogist's dream! The photo on the banner shows my mum and her brother and another of the family pets. The insert shows one of my other favourites which I have used elsewhere - a party picture featuring Tom's wife, Dolly, and their daughter, Marlene. I have dragged poor Marlene around several graveyards and former family homes over the years, as well as picking her brains about our shared family history.